The remarkable discovery of Friedrich Kellner's World War II diary. The treasure is stored inside a bank vault, locked in a safe-deposit box. He brought it home for one day to show to a visitor. "It gets more fragile every year," the man reminded himself, and gently lifted the object from its carrying case. 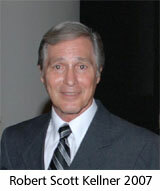 Robert Scott Kellner, 66, is a small, mannerly man with soft brown eyes and full head of graying hair. He talks in a whispery voice, as if careful not to wake a baby. One might assume this soft-spoken figure has tiptoed through life, trying to blend in, hoping not to be overheard or noticed. In truth, he has devoted his adult life to telling everyone who will listen about the significance and value of the heirloom he possesses. Sharing the message is his vocation, his calling. Kellner believes with all his heart that the entries meticulously penned in old German script on page after page of accounting ledgers are historically illuminating and relevant today and belong not only to him - and the Kellner family - but to the world, to every one of us. In his hands he held a sacred trust: the secret diary of Friedrich Kellner. From 1939-45, his German grandfather risked imprisonment - and possibly execution - by writing about the political atmosphere in his beloved homeland during the reign of Adolf Hitler and the Third Reich. A midlevel government official and member of the Social Democratic Party, which Hitler banned after coming to power in 1933, Friedrich Kellner denounced the Fuhrer as a "peddler and fanatical rabble rouser" in his diary. He passionately challenged the falsehoods of Nazi propaganda and related eye-witness accounts of atrocities committed against Jews. In the 860 pages, Kellner called for America and other democracies to stand together and fight against terrorist regimes. Fearing a repeat of history, he urged future generations to combat the resurgence of mindless prejudice and totalitarianism. A former Texas A&M English professor, Scott Kellner has spent more than 35 years translating Friedrich Kellner's legacy and fulfilling a promise. The 10-volume diary, filled with hundreds of newspaper clippings, was displayed last year at the George Bush Presidential Library and Museum in College Station. A Toronto television company recently produced an hour-long documentary about Friedrich Kellner's journal and life. The grandson is so committed to his mission that he wrote to Mahmoud Ahmadinejad last year after the Iranian president publicly stated that the Holocaust was a "myth" and called for Israel to be "wiped off the map." In his letter, Scott Kellner asked to meet the Middle East leader so he could hand him a copy of the diary. "Any ideology that doesn't have as its first value human life and personal liberty for human beings, is an evil ideology." "I'm not foolish. I'm not an idealist," he said, as if to answer those who might label him as such. "I don't expect anything I say to Ahmadinejad would change his mind. But any ideology, such as Islamic fundamentalism, that doesn't have as its first value human life, and personal liberty for human beings, is an evil ideology. "It sounds corny, I know. But the reality is we must confront him. I can do so with the diary. With the truth." Gazing at its brittle pages, Kellner faintly smiled in private thought. The handwritten words of his grandfather call up fond memories of the white-haired author, a man who was 75 when they first met. Kellner also thought of his own father, a flawed and tragic figure. And in his mind's eye he glimpsed the image of himself - an orphan who never knew the gift of family love until, by a stroke of fortune, he found his grandparents, in a tiny German village. And so began a story of discovery that is as remarkable as the diary itself. Fred Kellner deserted his family when son Scott was 10 months old. At age 4, Scott and his older brother and sister went to live at a Jewish children's home in New Haven, Conn. They were left to that cheerless existence by their mother, who went off and became a carnival dancer. He quit school after the ninth grade, and he joined the Navy at age 17. Two years later, in 1960, the young sailor found himself in Frankfurt, Germany, en route to duty in Saudi Arabia. During a 48-hour layover, Kellner asked and was denied permission to leave the base so he could look for his German grandparents, on his father's side. Impetuous and strong-willed, he ignored orders and went AWOL. Kellner didn't speak German. He began his search with only one clue: a scrap of paper on which was written "Laubach," the name of several German towns. Traveling by bus, he went to three villages, stopping strangers to ask whether they knew of a Friedrich and Paulina Kellner. In German, the family name means "waiter," so some mistook the American's inquiry and directed him to the nearest cafe. Kellner departed each town in frustration, wondering whether he might be leaving his relatives behind. On the third day, Kellner sat in a train depot in Hungen. When a teenage girl greeted the U.S. serviceman with a flirtatious smile, Kellner introduced himself and asked for help. Ursula Cronburger spoke English. She lived in a small town 10 miles away called Laubach. Not only that, she told Scott that an elderly couple named Kellner lived in her neighborhood, and so they took a bus to the town. Uncertain that Scott Kellner and the couple were related, Cronburger and her parents went to the home of a reclusive man and his wife and told them that a young sailor from the U.S. was looking for his grandparents and wanted to meet them. Dressed in his Navy whites, Kellner felt excited and apprehensive as he walked up a dirt road toward the cottage on that October day, with winter in the air. Scott assumed that his grandfather, a former justice inspector, had been a Nazi during World War II. He assumed that Friedrich Kellner, a former justice inspector, had been a Nazi during World War II. That's what Scott's mother had called Fred Kellner - her husband, the man who walked out on her and their three kids. "That Nazi (expletive)." Fred Kellner grew up in Germany and became enamored with the Nazi ideology as a teen. In 1935, Friedrich and Paulina sent their wayward 19-year-old to America to save him from being drafted into Hitler's army. Fred became involved with the German-American Bund, a pre-war American Nazi movement, and was reported to the FBI for making anti-American statements. To demonstrate his allegiance to the U.S., he joined the Army and late in the war served in France as a guard and interpreter at a camp for German prisoners. Scott's father never returned to America. After the war, he became involved in the European black market. In 1953, having failed as a parent and feeling like a man without a country, he turned on a gas stove and killed himself. He was 37. Friedrich and Paulina grew despondent. They felt as if their own lives had ended with their son's suicide. Now, amazingly, the child of Friedrich Kellner's only child stood at his door. His presence was like sunlight filling the grief-darkened home of the elderly man and wife. Any doubt that Scott had come to the wrong place vanished when he produced a photo of his young father. The tears came for all three when Friedrich Kellner opened an album and showed his grandson the identical picture. "I knew I had found them," Scott Kellner recalled, eyes shining as he retold the story. His visit lasted four days. Within the first 30 minutes together, his grandfather went into the dining room and knelt before an ornate antique hutch. With the turn of a small key, he opened a compartment door. Reaching inside a secret place, he withdrew a thick sheaf of papers - ledgers - meticulously written in the old man's hand. Even in 1960, he kept the document hidden. Friedrich had penned two words on its cover: "Mein Widerstand." It means "My Opposition." In a moment of dawning, the young American understood. This was a journal, his grandfather's diary, written at great peril during one of the most dangerous periods in history. 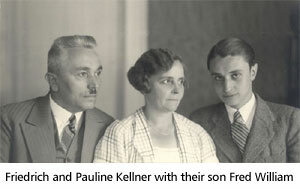 Friedrich Kellner fixed his grandson with his gaze. He desperately wanted the young man to know that he had resisted and rejected the madness of Hitler's dictatorship. "Ich war kein Nazi!" the grandfather said, his voice rising. "I was no Nazi!" He emphasized "no" by making a slashing gesture with his flattened palm. In the 1930s, Friedrich had spoken out in opposition to the rise of Nazi power. He defiantly held up a copy of "Mein Kampf" at rallies and ridiculed Hitler's autobiography and political ideology. "I could not fight the Nazis in the present... so I decided to fight them in the future." Friedrich would tell his son's son, "I could not fight the Nazis in the present, as they had the power to still my voice. So I decided to fight them in the future." The wartime diary, he explained, was his gift to future generations, to be used as a weapon "against any resurgence of such evil." For hours, the old man and his grandson sat at a table. Using dictionaries, they patiently conversed, translating word by word. Scott learned that after the war his grandfather was appointed deputy mayor in Laubach, where he helped to restore the Social Democratic Party. Friedrich told his grandson that one day he wanted him to take the diary to America, but first - the grandfather was emphatic - the young man needed to return to school. He must get all the education he could. He simply must. When Kellner returned to the military base in Frankfurt after a week's absence, he was placed under guard but not severely punished for his insubordination. "I would have willingly spent a year in jail," he said. "It was something I just had to do." Eight years passed before Scott would see his grandparents again. During the interim, he earned his GED and put himself through school at the University of Massachusetts, majoring in English and European history. He also studied the German language and later earned a Ph.D. He returned to Germany in 1968 and brought the diary home. Two years later, as promised, he took the first painstaking steps of transcribing his grandfather's old German handwriting into a more readable form and then translating that manuscript into English. Needing help, he wrote to every major publishing company in the U.S. but received form-letter rejections. "This is not like the Anne Frank diary," Kellner said. "My grandfather deliberately chose not to write about himself or his daily events - what he had for breakfast that morning." As Kellner read the entries, he longed for - hungered for - just that: some personal information about his grandfather. Yet the more he read, the more his respect and admiration grew for the man's wisdom and foresight and for his abiding love of country. Kellner continues trying to use the journal for good. He still hopes to get the document published in English and widely distributed before offering it to a prominent museum, possibly the soon-to-be-built Canadian Museum for Human Rights in Winnipeg. Passing along the gift that was given to him will be the last chapter in what is at its core a love story. 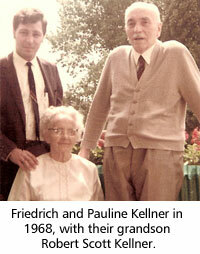 Kellner's grandfather was 83 and his grandmother 81 when he returned to Germany in 1968. Two years before their death, they took their grandson to a singing festival in a majestic castle on the Rhine River. A German choir performed, as did singers from America. That evening, as the joyous music filled the ancient fortress in the town of Mainz, where the couple had lived before the war, Friedrich Kellner felt so moved that he began to sing along. Some seated nearby shot him disapprovingly looks. The man who was wounded as a soldier during World War I, this poet and artist who once scuffled with Nazi brownshirts, this eloquent, freedom-loving patriot blithely ignored those who told him to hush. He would sing if he wished. And why not? In German and with a smile, he told Scott seated next to him, "The entire world should be singing." Click here to read some diary excerpts. Reprinted with permission from the Fort Worth Star-Telegram (Fort Worth, Texas). In the third picture in the article ("Friedrich and Pauline Keller with their son Fred William") their son Fred William -who sympathized with the Nazis- does look strange, his face is strange, and I would almost say that his face could have passed as a 'jiddishe punem'. The diaries are now published in German (july 2011) under the title Vernebelt, verdunkelt sind alle Hirne«: Tagebücher 1939-1945 " Personally I think the originals should be returned to Germany and kept in say the remembrance centre for the German resistance in Berlin so that schoolchildren, students and vistors can see them. The purpose of the diaries was to educate future generations in Germany. US Americans as a rule do not speak German and viewing any orignals becomes so meaningless to them. i knew a Kellner family in Queens New York. Richard was the name of one son and Scott was the other< i believe . any relation? Exposed German hand-written diary condems Natzism as Devils. Dear Sirs or Madams,I am an 83 yr. old woman. My husband is 93.He is a veteran of WW2 and served in Patton's army in a tank.He survived the invasion onto the French beach and rode into Germany and victory.I thank you for bringing this story to my computer.I thank Aish.com with all my heart. And there are many such untold stories of people we never hear about. But like Friedrich Kellner's life experience should be preserved for future generations. - And Holocaust Deniers. Please preserve and publish this! Robert Scott Kellner is a good man who took a risk even to go meet his grandparents. How this journal came into his hands is important and I am thankful to have read it. Please let us knwo when this journal gets published-- the world needs to read it. As Golda Meir once said about visiting Germany, "it's such a fight between the heart and the mind..." I knew there were [very few] anti Nazi Germans during WW2, and now we come "face to face" with one. A step closer for us not towards forgiveness, but towards thinking of Germans as good. Preserve this truth and "Righteos among..."
Scientists now have aspray plastic to apply to pages of books that are crumbling. This diary is a heritage and a light to the world of a horrible truth and should be preserved! The name "Friedrich Kellner" should be placed at Yad VaShem as one of the "Righteous Among the NAtions"
You can self-publish on lulu.com and print only one copy to proof-read or one even cheaper online copy to proof-read. It's then print on demand by any potential reader. If Jews would help him publish it, it would not be difficult. But I would recommend that a non-jewish publication publish it so that no one could claim later that it's another propaganda. Either way, it should be published! No question about it. This is a heartwarming and inspiring story. 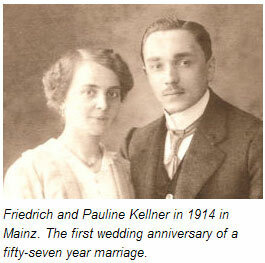 Thank you very much, Friedrich and Pauline Kellner. Thank you very much, Robert Scott Kellner. Rest assured that Hashem remembers all your good deeds. May your names be remembered and your deeds of sacrifice be honored by all peace-loving people. What an amazing story ! Thank you Mr. Kellner in so many different ways. You are a chip off your grandparents' block ! Big Mazel Tov. A moving article. This couple survived the war, but millions did not. This account might eventually remind those staunch fundamentalist that the price to be paid by such doctrines is too high for all of humanity. Hitler is a reference in today´s world, as many continue to pursue antisemitism and thus make him come alive once again. Nowadays he could self publish and sell it online, possibly from Aish.com. I don't understand why he is considering sending it to a museum in Canada. He should be consulting with specialists on how to care for the papers. There are people with expertise concerning the subject. A fascinating story. A thanks to Scott for sharing. The diary should be completed and shared with all. We have to remember that although there was so much evil, there were many good souls. Thanks for such a beautiful account. It was very well written. condem and keep us from forgetting the evil of that time. Justice. Should be told to the hole world. Every effort should be made to see that this is published; & hopefully made into a movie. This information is a must for the world to know. Are there no publishing companies with courage and commitment to freedom and justice in America????? I would like to see the entire story of the kellner family published. A parallel narration of the grandfather's diary in the past and the grandson's life in the present with the tragic and joyous events that connected them matched up together in the book. I do a lot of proof reading for people's manuscripts and a dual autobiographical novel of grandfather and grandson being reconnected and their lives being reformed for the good is a great premise. I would love to see this in print. Incredible story - truth is often stranger than fiction. The Kellner diaries must be published for all the world to read & learn about this courageous mentch - truly righteous among the nations, & his message for the world of today. Kol Hakavod! An amazing story of courage in the face of grave danger, and determination to reconnect with the lost family. As I read the excerpts from the grandfather's diary I felt as though I were in the same room with him as he committed to paper words of opposition that, had he been discovered, would very likely have meant imprisonment or even death. I would love to be able to read the entire diary. Seems some publishing company would jump on this opportunity. What an amazing and moving story! I also hope it gets published and soon. Great story for the fatherland. My Grandfather too fought in WWI and refused to fight with the Nazi and left for America. I would love to read our book, look forward the it's publication. Best wishes. Herr Kellner, please don't give up in your efforts to publish your grandfather's "Wiederstand". Many of us felt that way but could not verbalize at the time for fear of backlash by the NAZI regime against them and their children. It was a terrible life my own parents and grandparents had to endure. I hope we will learn from the stories told. These witness accounts MUST NOT die but be taught to generations to come. My great grandparents came from Germany and I am proud to see that there is such a man as Frederich Kellner to tell the truth about the Nazi's and a mad man named Hitler. I remember somewhat things of the war as I am 72 and remember reports of atrocities unspeakable. My older brothers were in the Army and Navy at the time and we worried for them. If this note reaches Scott he may want to think about contacting the director Steven Spielberg for held in getting this journal publisher. Just a thought. I look forward to it's publication that I may read it in its entireity. Please for the sake of this world, publish these writings of your grandfather. The whole world needs to remember the devastation that was caused by this monster - Hilter. God bless you Mr. Kellner for what you are doing. God bless the Jewish people and protect them from this happening again to them! If only more citizens of Germany had displayed their anger as Herr Kellner, perhaps the rise of Adolf Hitler could have been nipped in the bud. Sadly, there seem to have many folks who were so desperate to salvage Germany's economy and image of strength that they were blinded by their hopes and dismissed the negatives until it was too late. I, too, hope that this diary will be published for the world to see. Thank you for your faithfulness to the assignment of sharing this incredible piece of truth. You have a treasure that can stand against the tide of lies. Thank you for caring enough to share. We need to see this published! I would love to hear more of Herr Kellner's "Weiderstand". We all need to hear it from the inside, from people who lived every day of it.. too often this history goes the way of those who lived it.. to the dust. It should not be so! Bravo Mr. Kellner, please finish translating and publish this important work. We need these bits of true history for all to read. The war was real, was horrible, must never happen again. I hope he will offer copies to all the human rights and holocaust museums around the world. The world needs to see it! Unbelieveably touching! I look forward to reading the entire diary when it is published. The world needs to see it so it can learn the lesson that it never should happen again! People like Robert Kellner should be highly commended for caring enough to devote their lives for the truth and the future of humankind. Thank you for sharing the work of your grandfather and for sharing your story. I read the excerpts. Only a first-hand account such as this gives one a true feel of what it may have been like to live in Germany at that time. I would like to read all of it. Even if Mr. Kellner must self-publish, this important account MUST be published. I will buy the first copy. Feeling for what Kellner went through as a grandchild on a search is one level, taking us to the grandfather another, the father who gave up a third. Hitler's influence corrupted souls for generations... may we be free from this soon with large wonderful families which come to replace what he sickenly took away from us. May his name be erased through our good deeds. Say Amen.